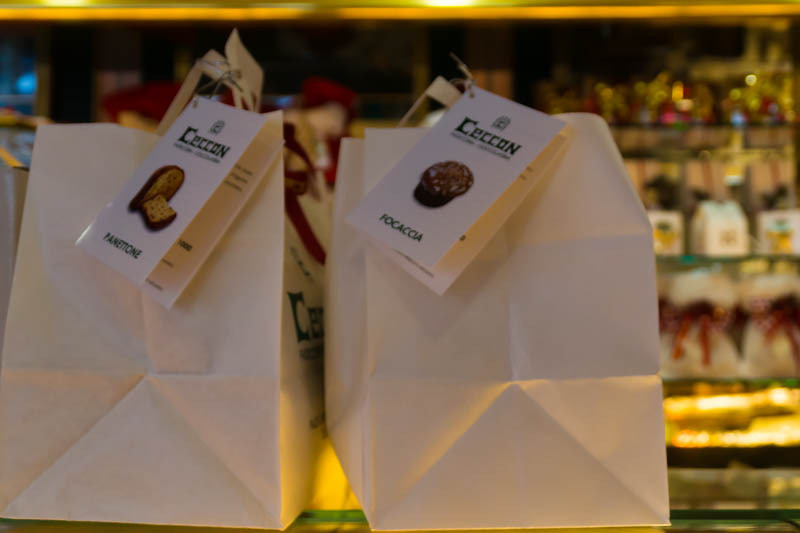 The first time I tasted the Ceccon family panettone, it simply melted in my mouth! I was speechless, I had never tasted something quite as silky smooth. And believe me I have tasted all sorts of Italian Panettone before. 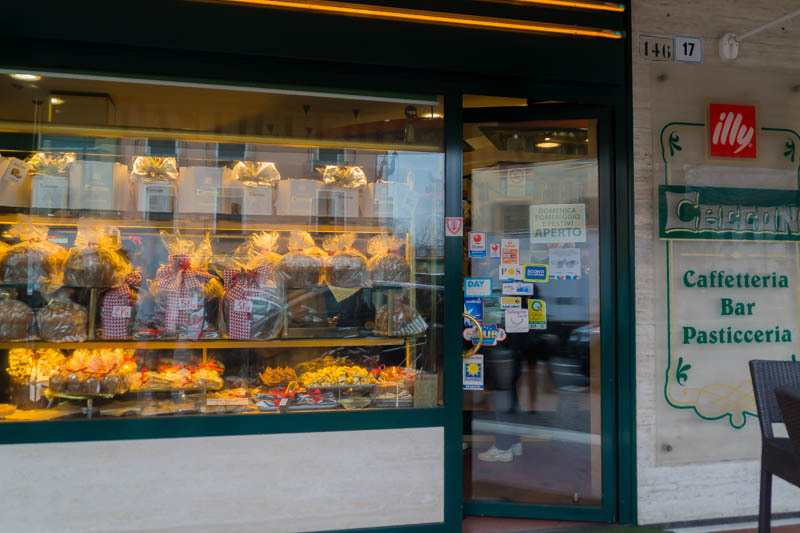 My husband looked at me and said I really needed to write about the Pasticceria Ceccon. For two days, since arriving, we had passed their shop and admired their window display. We were in Italy for a long weekend in Venice and as usual had chosen a hotel on the mainland in a nice part of Mestre. It has a church, picturesque squares, restaurants, just twenty minutes away from Venice by bus. Many people do that to save money or to get away from the touristic hotels in Venice. Since we usually drive to Venice, it is a great solution for us to leave our car parked safely as you can’t enter Venice by car. One evening, my husband went to Pasticceria Ceccon to get us dessert and that is how we fell in love with their panettone. As he wanted to see how good it was, he bought a “panettoncino”, a tiny individual panettone. We each enjoyed a wonderful but far too small portion and I suspect, if given the chance, we would have eaten a full sized panettone that evening. 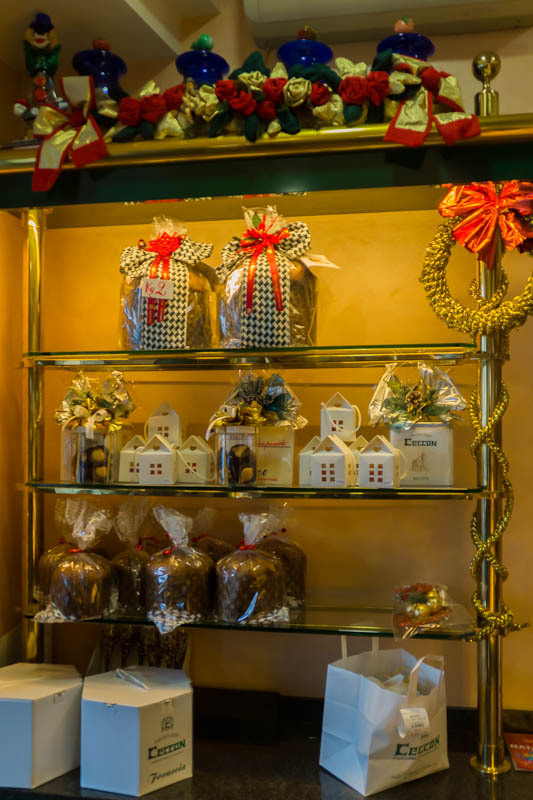 Christmas is around the corner and I knew the Venetian Christmas tradition includes sharing with your family either a Focaccia veneziana or a Panettone or both. I wanted to know more now. So after researching a bit their story and realizing this was a family business built from hard work and a vision to respect and keep the traditional methods of baking, I had to try and talk to the family. We went in one evening almost at closing time. The owners, Maria Grazia and Paolo Ceccone looked busy cleaning up for the day but they welcomed us with a warm smile. We all hesitated, the language barrier was a bit tricky at first. Being Portuguese gives me the advantage of understanding a lot of Italian but speaking is a whole different matter. So finally in Spanish I managed to tell them I really wanted to know more about their family enterprise. 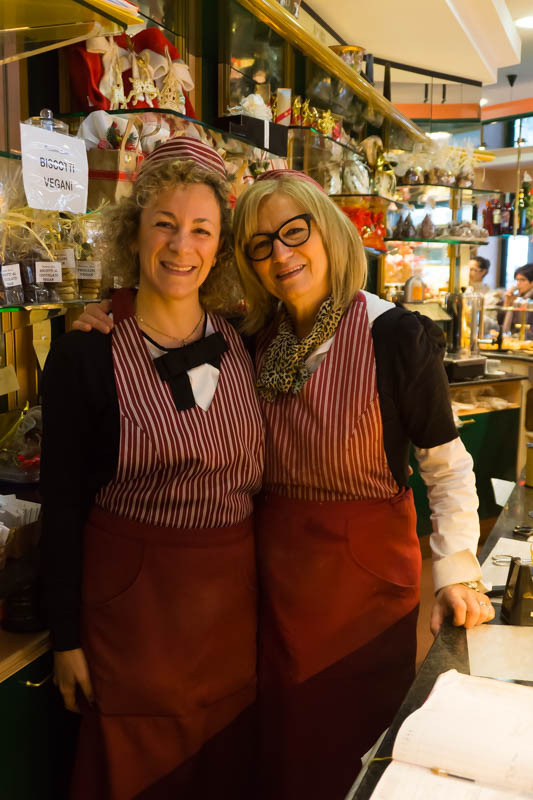 They smiled when I said their panettone was the best I had ever tasted. And then Maria Grazia told me to come back the following day to talk to their daughter who could speak English and explain the family history. When we entered the shop the following morning it was literally rush hour. The shop was full, bustling with energy, many clients having coffee, others ordering small pastries, chocolates and of course the Christmas cakes, Focaccia and Panettone, their speciality. It was December 8, a catholic holiday but still you could see how popular they are. While taking in the wonderful smells of fresh coffee and freshly baked pastries and cakes, I observed for a while. Many clients were greeted by name and everyone was warmly welcomed by all the members of the family. Even children would get a special attention or greeting. The sort of neighborhood pastry shop and cafe I love and want to come back to. Finally I made a sign to Maria Grazia and she smiled and came to introduce me to her daughter, Martina Ceccon. She was happy to tell us a bit of their family history. She explained how her father, who is Venetian, started at 14 as an apprentice of the best pastry chefs in Venice. With them he learned the craftsmanship and how to choose the best raw materials. In his twenties, he realized there was a gap in the market. These were the 1970’s and at that time there was no pastry shop open to the public in Mestre. 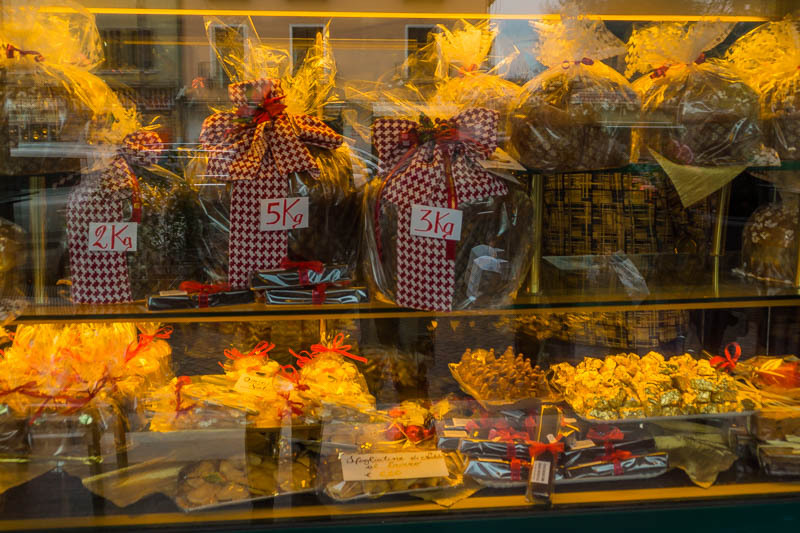 There was only a place that baked the Venetian Christmas cakes and then sold them to bakeries. 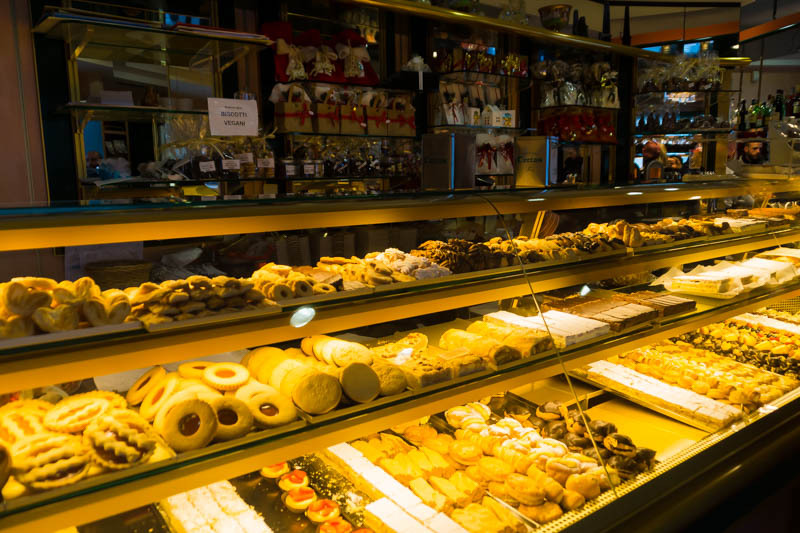 That is when he decided to open his shop at the Piazza Carpenedo where he started baking and selling to the public an assortment of pastries and the famous focaccias venezianas and panettones. Paolo always attached great importance to only using the best ingredients and respecting the traditional methods. The most important ingredient is the natural yeast used in the sour dough of the focaccia and panettone. It took them years of research and trials to achieve the quality and level they were seeking. Being a natural ingredient, it makes baking even more difficult as you have to take into account the temperature throughout the year as well as the baking time. 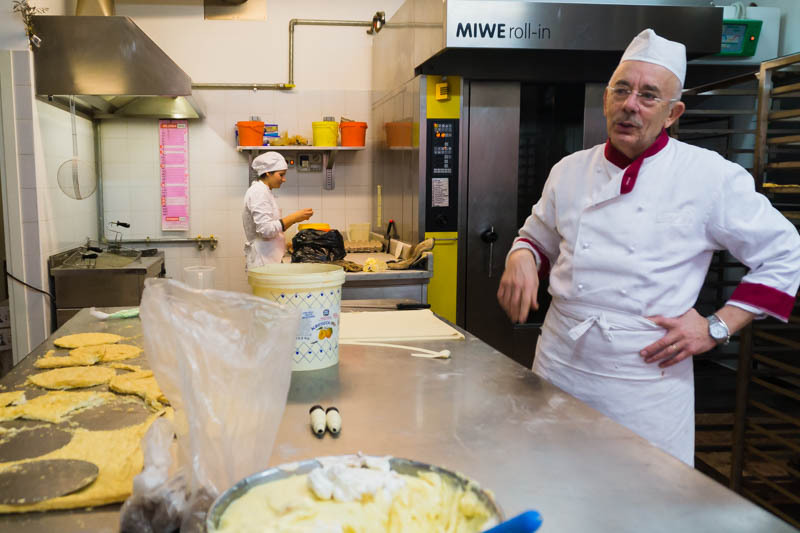 But Paolo is proud to have been able to preserve the craftsmanship and the traditional method of baking the Focaccia and Panettone. 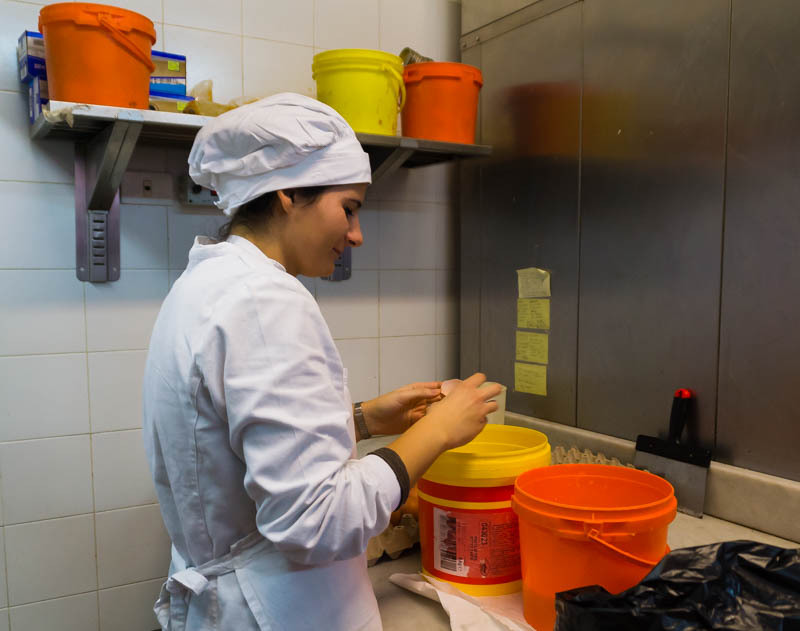 Martina, explained that even the cream used in their pastries is still done by hand as they feel it is the only way to get the consistency they like. There are no additives or artificial flavors in any of their products. 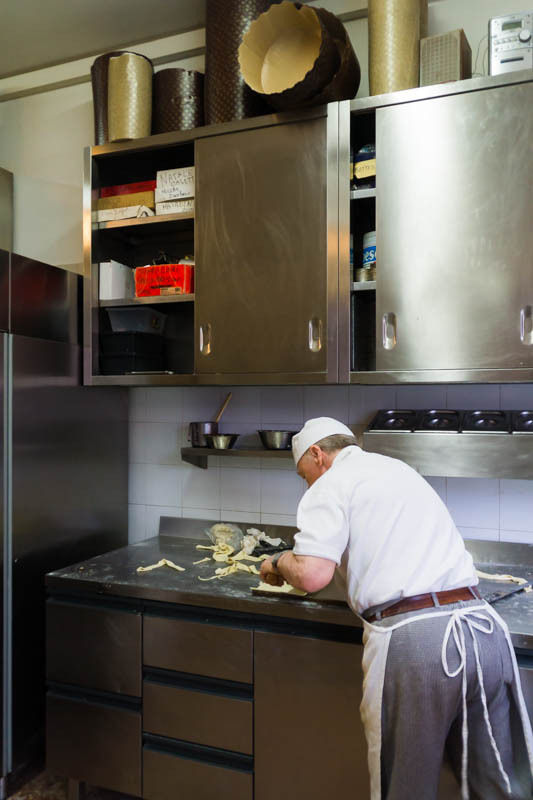 Being the baker meant his wife, Maria Grazia, naturally became the hostess, receiving warmly their customers and building a relationship that has grown throughout the years. And here is glimpse, a video given me by the family to show how much care and passion they put into baking their panettone. The video shows they use the best natural ingredients, the basis for the quality that I was lucky to have tasted. 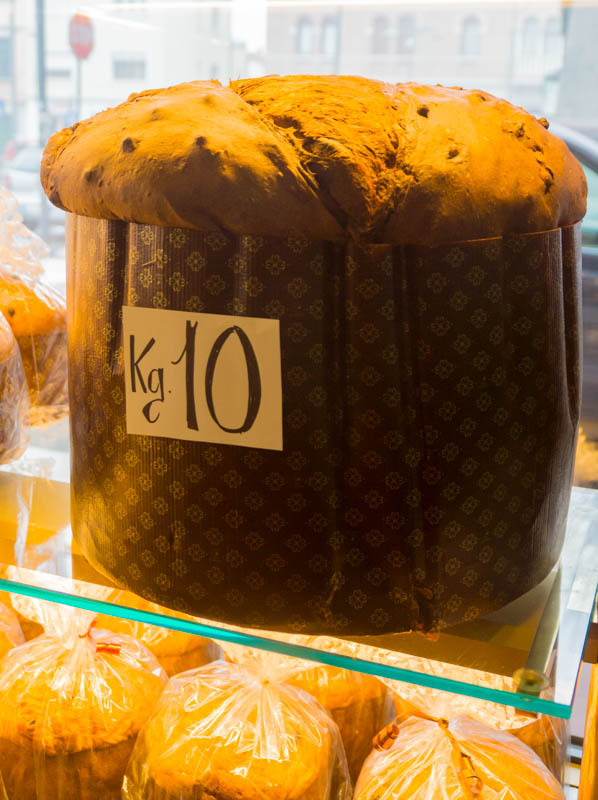 Martina then asked me if I had noticed the 10 kg panettone which was of course impossible to miss. She explained they do it for special orders, usually three a year. 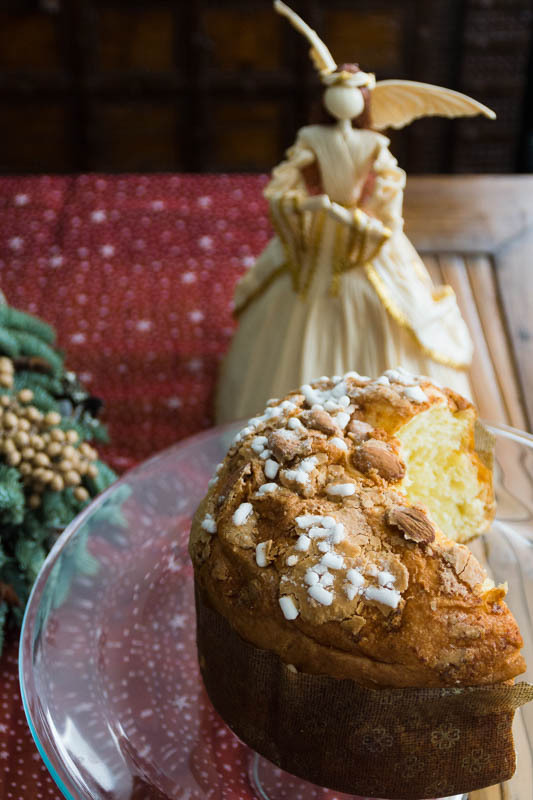 It is understandably the most difficult panettone to make. It needs to be constantly watched so that it does not get under or overcooked. It takes 3 to 5 hours to bake. Then once you take it out of the oven you have to turn it upside down and leave it for 12 to 24 hours to dry and settle. The one in the window was the yearly order for one of their customers. Someone who likes to offer his employees a very special treat for Christmas. Martina then offered to show us the “laboratorio” or working kitchen just next door to the shop which we happily accepted. When we entered there was a young baker patiently separating the yolks from the egg whites of a great amount of eggs. And her father Paolo and another collaborator were busy at work as well. Like father, like son, goes the saying. And here, it is no different. 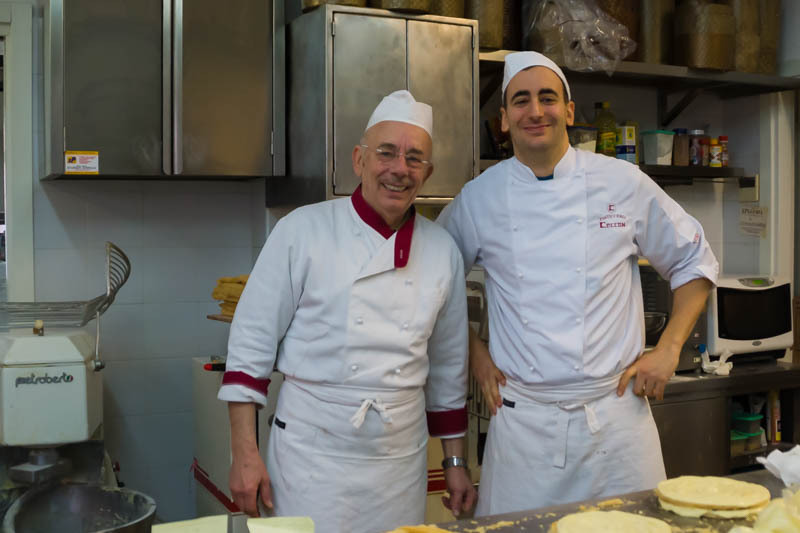 A few years ago his son, Francesco, joined the bakery and became one of the youngest artisan bakers in the area. It was great to see their rapport in the kitchen and their sense of humor. Also the passion and pride showed for their trade. It is nice and reassuring to see that the next generation is already at work to maintain this family enterprise and its traditional methods alive. The same of course goes for the other important half of this family enterprise, Martina and her mother, Maria Grazia. Martina has followed in her mother’s footsteps. The perfect host, someone that welcomes and shows care in preserving the relationships built over the years with their customers. She also takes care of the business side online. Before we left, I asked which cake was more popular the Focaccia or the Panettone. Martina explained it was the focaccia because children don’t like raisins so much and the focaccia has no raisins. I thought it was interesting since my daughter loves raisins. She also told me that this year they had introduced a new flavour, a cherry chocolate panettone. We wanted to stick to tradition so we decided to buy the classical Foccacia and Panettone to accompany us this christmas. The sizes start at 500 g and go up to 10 kg. And no, no 10 kg for us! Martina kindly offered my daughter a small, individual panettone which unfortunately she is not willing to share with us! We said goodbye hoping to meet again in the future. We will certainly go back next time we go to Venice. We are even considering whether we shouldn’t make Venice a regular pre-Christmas travelling tradition. And now the wonderful Ceccon focaccia and panettone will have to be part of our tradition. That and I really have to get round to taste that wonderfully scented coffee that greeted me when I entered. The Ceccones don’t really need my publicity but if you read some of my posts I feel strongly on writing about family enterprises that persevere from generation to generation. In this day and age where there is so much mass production and industrialized goods that only harm our health, I try to find and support families that still care about creating something that not only benefit our health but also maintain old traditions alive. So if you are visiting Venice, why not rest a bit from all the canal’s excitement. Go to Piazza Roma and take the bus nº 2 to Mestre. Find the Ceccon shop at Piazza Carpenedo nº 17. Have a coffee or cappuccino. Taste the wonderful pastries and buy a Focaccia or Panettone that you now know is made with a lot of care and love. When asked if there is going to be a third generation, Martina confirmed with pride that the future looks bright. She has three beautiful daughters and her brother Francesco has a son. I hope my daughter can meet and see the new generation at work one day. Next PostNativity: The Art of Provence's "Santonniers"
Gracias Carmen! We are happily enjoying the Focaccia and Panettone, it is nice to know they were done with such care and natural ingredients. Sounds delicious! Looking forward to try them out when in Venice/Mestre.. Lovely city with lovely food! Glad you enjoyed your trip..